If there was ever a minefield when it comes to board games, it has to be crowd funding. There is always those nervous moments when you open up the game box for the first time. Will all the pieces be there? Will they look the same as the concept art and prototypes? It can be rather stressful but all worth it when your worst fears are not realised. Although we never backed it, we did have these thoughts and feelings rushing through us as we opened up the review copy of Manasurge for the first time. Shiny cards! And a plastic baggie for the bits! It’s going to be ok; no one gives you a plastic baggie for the bits if the game is crap! c)	A spell enhancing card (called Metamagic cards). Every time a card matching the starting suit is played a shard is placed on that card. Cards with the same number as the last card played are considered a counter spell and reverse the direction of play. Metamagic cards have various effects depending on the card with examples being mirroring the last card played or changing the current spell suit. Play continues until a player is unable to play a card at which point the spell hits that person. The person hit by the spell takes damage (in the form of face down cards placed in front of them). All other players collect any shards placed on any of their cards and then draw up to 5 cards to begin the next round. Should a player ever run out of cards during a round, the will perform a Manasurge. This means the round is suspended whilst they collect 2 shards and draw 5 new cards. The damage mentioned earlier is also important as if a player ever gets 5 or more damage cards in front of them they need to perform a rebirth. This involves paying a shard as penalty (if you have one), discarding your current cards, and taking the damage cards as your hand. Once a player has 12 shards (10 for a 5 player game) they are declared the winner and the game ends. Manasurge is meant to be a light and fun family card game and it achieves this with minimal effort. The game is relatively easy to learn (think hot potato crossed with Uno and a teeny bit of Fluxx). The idea of players building a spell and adding to it so it doesn’t hit you is novel and fun. The whole decision of whether to draw cards up to your 5 card allowance is a neat touch as it brings in the whole thing of players hoping they can get rid of their remaining cards in the next round whilst the other players are possibly deciding to gang up on the fool who thought he could sneak 2 extra points by Manasurging. Other gameplay tweaks we really liked are the way each suit of the spell cards has an effect that essentially sets the rules for that round when that suit is the first card played. This combined with the Metamagic cards and their rule-breaking rules bring about a sense of chaos as you are uncertain how long each round may last. The artwork of Manasurge is also one of its biggest plus points. 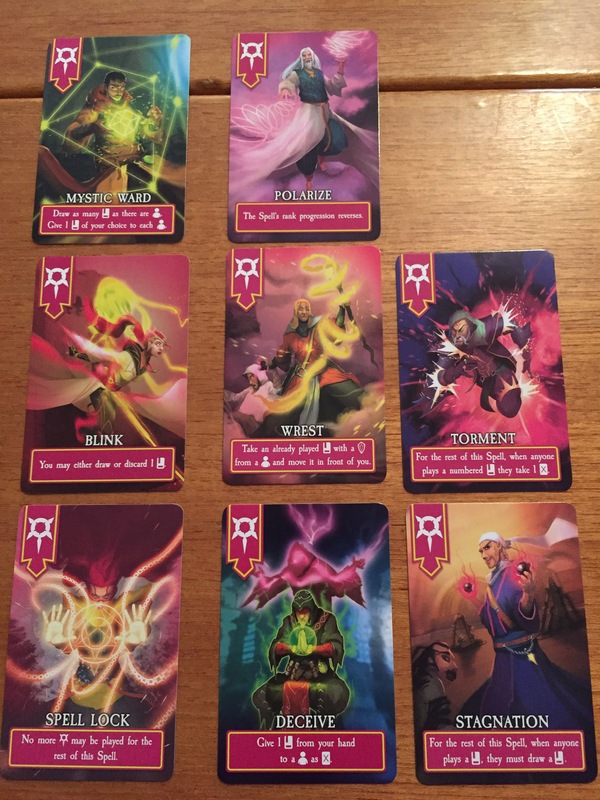 Each of the spell suits and the 14 metamagic cards look gorgeous; the colours are really bold and bright and suit the fantasy theme perfectly. The game also comes with a few extras which presumably were added during the Kickstarter campaign as stretch goals. 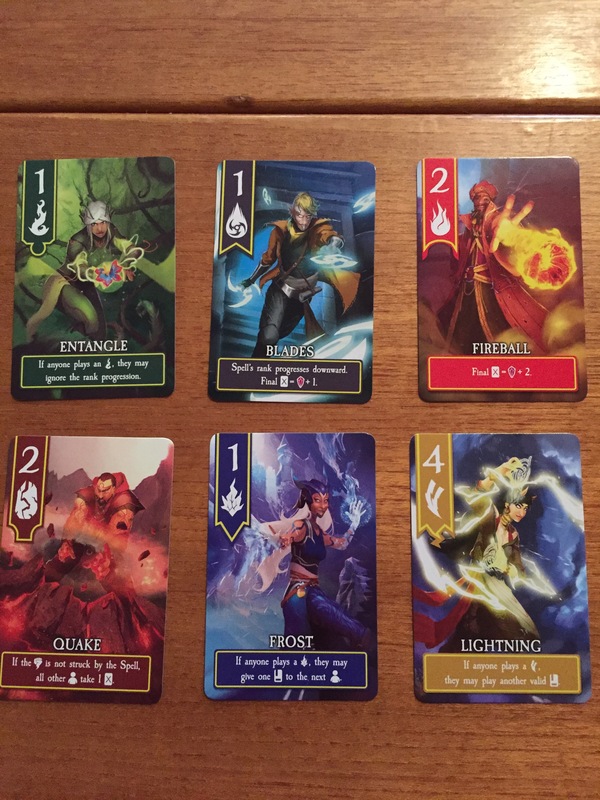 There is a sixth suit of spell cards that can be used to accommodate a 6 player game or to give you a choice of which suits to use in a 2 to 5 player game. There are also 8 wizard cards that can be used to add more the game once you are used to the rules. 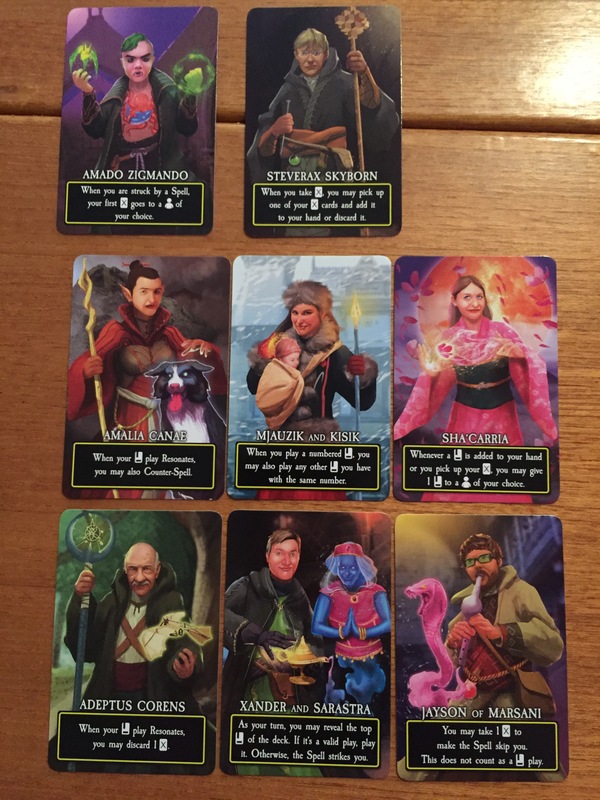 The wizard cards are randomly dealt out 1 to each player at the beginning of the game and give players a specific benefit. These extras not only add value to the game but look just as stunning as the rest of the game. As we all know nothing is ever perfect, and Manasurge does indeed have a few niggles. We found that playing until someone reached 12 shards was a bit too long. Because of their few and simple rules, fast paced family style card games tend to go down well when they last between 15 and 20 minutes and, at 30 minutes, Manasurge starts to become a little tedious. Luckily this is easily remedied when you reduce the victory requirement by a few points – 8 seemed to be a good number for us. Apart from the wee issue above (and a thematic question about how is it possible to rebirth without a crystal shard) we found Manasurge to be a well put together game. And although I had fun, I felt it didn’t do enough to replace other fast paced card games in my collection. 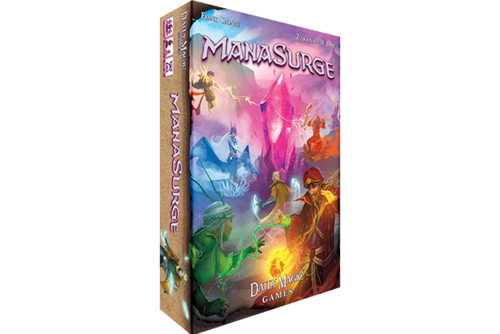 It is by no means a bad game and I shall give it a few more plays to see if my opinion changes but, should YOU be looking for a new filler game for your game group, you could do a lot worse than consider Manasurge.